Fly anglers are bonafide gear nuts, and it’s easy for beginners to feel overwhelmed at the number of products on the shelf. For those just getting started, selecting the right fundamental gear is essential. These are the items that will serve you on the water every day and will cover a wide range of scenarios. As you progress in your fishing career, all the extras that fill the stores will start making sense. Until then, here’s an easy guide to get off the ground and on the water with the right gear. Before you start shopping rods and reels, narrow down the primary species and conditions you plan to fish. One of the best all-around freshwater options is a 6-weight with a medium fast action. The 6-weight can tackle most trout situations while also serving you well for bass, small pike, steelhead, and more. It has that crossover ability to take on small and large fish. If you intend to target primarily smaller species like panfish along with some trout, a 4-5 weight is a nice rod. Larger species like pike, muskie, steelhead, salmon, and anything in saltwater call for at least an 8-weight. After settling on the weight, choose an action. A medium-fast action is ideal for beginner and intermediate anglers and can continue to be used as your skills advance. Medium-fast rods are forgiving but still have an excellent loading point for power. Fast action rods require precision timing and can punch through wind with large, wind-resistant flies. Medium and slower actions have a slow loading point for light dry-fly fishing. They might be fun but are not ideal for those just getting started. Your reel should have a solid drag system (washers or disks connected to the spool that rub together to create drag when the fish makes a run) and match the rod size. Purchasing a pre-assembled rod, reel, and line kit is a great move for beginners. A basic trout and freshwater reel from Waterworks Lamson, such as the Liquid or Remix is a good start, or you can grab a serious reel for everything from trout to big game from a company like Bauer. Big game and saltwater anglers should invest in a quality reel with a sealed drag system, as hard-hitting species require an excellent drag. Fly lines can be confusing thanks to the vast number of options. Starting out, a Weight Forward (WF) floating line that matches your rod weight will serve most purposes. If you have a 6-weight rod and reel, your fly line label will read WF6-F. The 6 means it’s designed to load your specific rod size and the weight forward means a good portion of taper is weighted towards the front. The frontloaded line loads easily and is a great all-around line choice. A Double Taper (DT) is another option, which means the taper is even on both ends of the line. While less aggressive, DT lines last longer because you can reverse the line after one side wears out. Outside of floating lines, you will find a wide range of sinking lines with slow sinking for stillwater, and heavy sink tips that penetrate the water column quickly. As your game progresses, the purpose of these specialized lines will become more apparent. Finally, you’ll need a tapered leader and a few spools of tippet to connect the fly line to the fly. The weight used for leaders and tippet depends on the species and fishing scenario. 0x-3x covers your heavier applications, while 4x-7x handle mid-range and light duty. 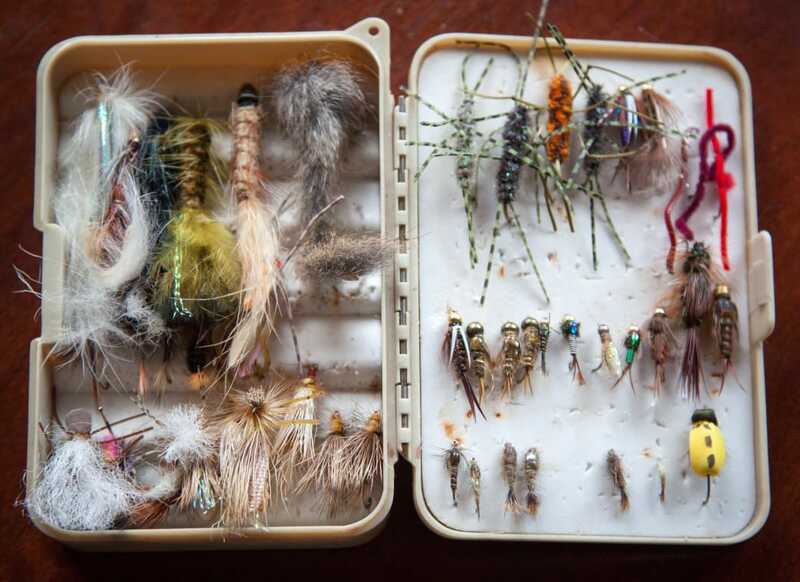 Fly selection can be a tough one for the beginner—the variables seem endless. If you are out of town, the best choice is to consult the local fly shop to find the best-producing patterns for your exact needs. Remember to show your appreciation for their input by stocking up at their store. Each species of fish has a few basic, tried-and-true patterns. For example, the wooly bugger is an excellent fly that you can dead drift, swing, or retrieve. 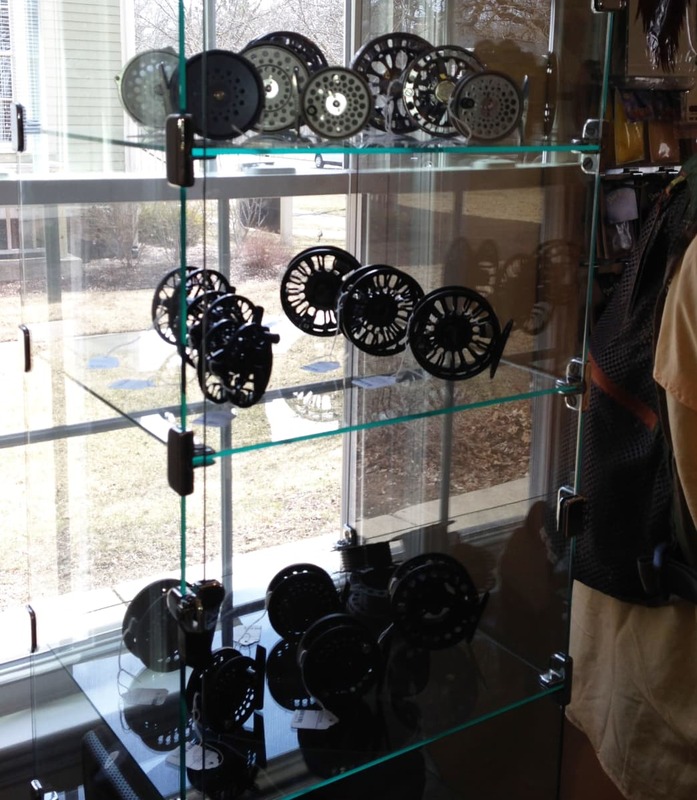 It will catch trout, bass, panfish, pike, steelhead, and salmon. Outside of general attractors like a wooly bugger, you will want a few dry flies like the Adams and Royal Wulff, along with nymphs like the Prince and Pheasant Tail for subsurface use. Throw in several streamers to accompany your wooly bugger and you have a good base of flies to get started. As with anything outdoors, dress in layers and prepare for the conditions. In the heat of summer, there is nothing better than shorts and sandals for wet wading on a cold river. As things cool off, waders are an absolute necessity. Wading gets you into better positions to catch fish, and when combined with warm base and mid-layers, you can fish through some pretty extreme weather. Looking for more information on “wadering up?” Feel free to call the shop with questions at any time. Always bring sunscreen and sun protection and wear a pair of polarized sunglasses in all conditions. Not only do sunglasses cut glare, but they also protect your eyes from flying hooks. A good pack is also essential for carrying fly boxes, tools, extra clothing, snacks, and water on longer outings. If you’re headed out for a short session, a bare-bones pack for your fly box and basic tools will suffice. These are not expensive or heavy to wear, and they are extremely efficient. For hauling extra weight on full-day expeditions, a full Fishpond Vest or backpack model is worth considering. While you don’t want to overload, it’s nice to have the extra space when needed. Always keep your tools, tippet, and fly boxes within easy reach and stash your rain jacket away for later. There are a few tools necessary for every outing. A quality pair of nippers is a must-have. They may seem overpriced, but you get what you pay for. Make sure you have forceps to pinch barbs and pull hooks, floatant to treat dry flies, and split shot for weight. Keep these items handy as you’ll use them while changing flies, landing fish, and adjusting rigs throughout the day. A landing net is another good option to help safely land and release fish. After you assemble your fly fishing outfit, hit the water and put it to use. YouTube videos, DVDs, or books will not give you the same quality of knowledge as really getting out there. Fish hard and as often as you can—nothing can substitute for simply putting in time on the water. As you learn, you will begin to add new fly patterns, line types, and possibly rods and reels to your arsenal. However, that first rig is truly special and will always have an important place in your gear bag. Written by Zach Lazzari for RootsRated in partnership with The Painted Trout. Great article…Love the suggestions for fly fishing for trout. It would be awesome if you put an article together like this one for trout…aimed at river fishing for smallmouth bass.